To view our current inventory of fine antique sextants, octants and navigation instruments, click here! This Fine Instrument Has Been Sold back to Germany, Thank you! For Someone Who Can Afford the Finest and Rarest of its Kind! PRESENTED is an extraordinarily rare mid 19th C mariner's sextant with ebony frame, ivory graduated arc and vernier, and bronze fittings. This instrument is so rare that we have only seen pictures of one other. On the ivory name plate, in the center of the gently curved cross bar which is a Filby trade mark, there is inscribed "D. Filby . Hamburg ." with the number 1083*. We have never seen a Filby instrument offered for sale before this one. For those so inclined, this would make a worthwhile contribution to a museum such is its rarity and fine quality. Our very reasonable price is less than Fair Market Value. This beautifully made instrument has a ribbed brass index arm measuring 11 inches. The arc measures from - 5 to plus 100 degrees. The top horizon mirror is on an adjustable turntable and can be rotated by loosening a screw which locks the mirror's position. 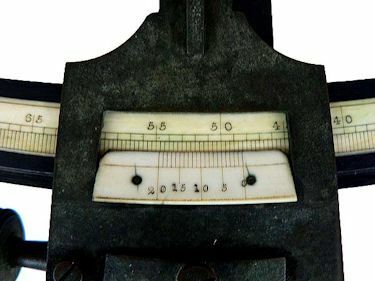 Note the early form ivory vernier scale, reading from right to left from 0 to 20 arc minutes, two hole peep sight with "flap", and three sun shades for the index mirror and two for the horizon mirror. We do not take the number 1083 * to be a serial number or date because the instrument's style makes it an octant and because the business was only started in 1837. All of its features indicate the instrument to be from the middle of the 19th century, likely Ca 1840. "From Sextant to Satellite Navigation, 1837-1987" particularly the picture on page 25 which could be of this instrument except for its later style single peep sight which is also threaded for a telescope. Note the picture with the green background as below. As shown in the C. Plath book "From Sextant to Satellite Navigation,1837-1987"
Some time after 1780, the addition of a tangent screw as fitted here allowed for fine adjustment and represented one of the two major changes in the basic operation of the octants and sextants for the next 150 years! The second was the fitting of telescopes. As was the practice with octants, only peep sights were fitted. Later a handle was added to sextants. All of these tell tales indicate it is one of the earliest of that type offered by David Filby making it a noteworthy instrument by this maker in more than one respect. CONDITION: The instrument, its ivory name plate, sharply and precisely engraved graduated arc, and its hardware are in museum quality condition. There is a nice patina and verdigris of age. All three bronze legs are present. A small piece is broken off the spring clip on the index lock which doesn't impair its use. Missing is one the small ivory scribe, and the small ivory plate on the back. The horizon mirror is in remarkably good condition and the index mirror has little silver remaining. The instrument has that nicely worn look that comes with over 165 years of age. There is no case. Width of frame at arc 9 3/4"
PROVENANCE: David Filby was born in 1810 in Husum, Germany. His father was an innkeeper. In 1820 the family moved to Hamburg which was a major seaport with vessels arriving and departing for Britain, France, Portugal and Spain, and the United States of America as well as to the Caribbean and South America. Nothing is known about Filby’s youth. In 1830, at age 20 he began a four-year apprenticeship as a “mechanikus” in the workshop of Heinrich Johann Kosbu, an instrument maker for Physics. Kosbu’s workshop was adjacent to what was then the inner port in the centre of Old Hamburg, Those who worked on the Kehrwieder came into daily contact with the ships, the captains, the mates and the crews from countries all over the world. After completing his apprenticeship, he continued to work for Kosbus until he set up his own business in 1837 at age 27. To legally be in business his firm had to be registered, and the owner had to be a citizen of Hamburg which was a separate State. Filby did not achieve citizenship until 1840 having operated his company illegally for the 3 preceding years. Years later, this beginning caught up with Filby due to a clerical error in filing the notice of the sale to Plath. He was brought before the commercial court and fined 15 marks, a cause of embarrassment since he was by then a delegate to the city parliament. The Filby shop was on the Vorsetzen directly on the so called “Rummelhafen” where large numbers of sailing ships frequently blocked the view over the Elbe. In his shop he stocked charts, nautical literature and increasingly nautical instruments, which he first imported from Britain, the country then known worldwide as producers of the best instruments. As was the practice, Filby had the first instruments he sold, marked with the name of his firm, D. Filby, Hamburg”. He soon set up a repair workshop for nautical instruments, which grew in the course of the of the next few years into an independent factory for the production of nautical instruments comprised mainly of sextants. For the next 25 years the firm devoted itself to serving the needs of seafarer's by providing nautical instruments of the highest quality, and their sextants were known through out the maritime industry as some of the best. These efforts quickly brought him success and public recognition. For reasons not known, he sold his business to Carl Plath in 1862, when he was just 52 years old. When Plath acquired the Filby firm he chose to name his new company, "C. Plath, D. Filby's Successor", indicating the high esteem he had of Filby's business and his intention to maintain Filby's tradition of importing, making and selling navigational instruments. After the sale, Filby devoted himself to numerous honorary offices until his death. In 1882, three years after Filby's death, Carl Plath sold the nautical literature and charts department of the business to the newly established firm of Eckardt & Messtorff, a bookshop which is said to exist today keeping the nautical instrument business as the foundation of his own. The Filby Foundation for the relief of poor and needy seaman and seamen’s widows in Hamburg” and “The Filby Foundation Prize for the Hamburg School of Navigation were established in 1894 and operated until 1923. C. Plath ceased sextant production in 2002 after 137 years. OUR UNCONDITIONAL GUARANTEE: If not completely satisfied with your purchase it may be returned, if without damage, within three days of receipt in its original condition and packaging. Returns must be insured for their full value. All that is required is a prior email authorization by us for the return. Unfortunately, no refund can be made for the cost of shipping, packaging and handling unless due to our error. International buyers welcome, but inquire first. We have satisfied customers in Australia, Austria, Belgium, Bermuda, Canada, Chile, Denmark, England, France, Germany, Holland, Israel, Ireland, Italy, Japan, Kuwait, Mexico, New Zealand, Norway, Nova Scotia, Saudi Arabia, Scotland, Singapore, Spain, Sweden, Switzerland, Thailand, USVI and the Eastern Caribbean. THE FINE PRINT: We take extra special care in shipping by FedEx Ground and require the item be insured for your protection and ours. Shipping is an additional charge to the buyer, but we bill it honestly covering only our out-of-pocket expenses. PAYMENT: Payment shall only be made by Cashier's Check, bank to bank wire transfer, money order, or personal check in which case, shipment will be made after the funds have cleared. No PayPal or credit cards accepted on this offering. .